Court bars Ikoyi registry from conducting weddings – Royal Times of Nigeria. 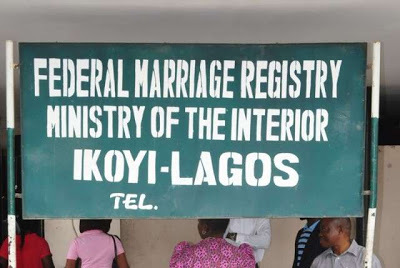 Justice Chuka Austine Obiozor issued a restraining order to the Ikoyi registry from conducting marriages, saying it is unconstitutional for the Federal Government to perform the duties of the state and local governments. He said, “We are going to use every available platform in the five divisions across the state to sensitize our people and inform them about this latest development; From Epe to Ikorodu, Badagry, Ikeja and Lagos Island,”. In his remarks, the president of the marriage registrars in all the local government and local council development areas, Deji Sokeye, said the responsibilities of the LGAs/LCDAs has come back to them by the virtue of the law and as provided for in section 30 (1) of the marriage act and section 7 (5) of the 1999 constitution.